Published: Jan. 15, 2014 at 09:09 p.m.
How will Colin Kaepernick's performance against Seattle compare to the rest of his season? Find out with these 10 mind-blowing stats for Championship Sunday. 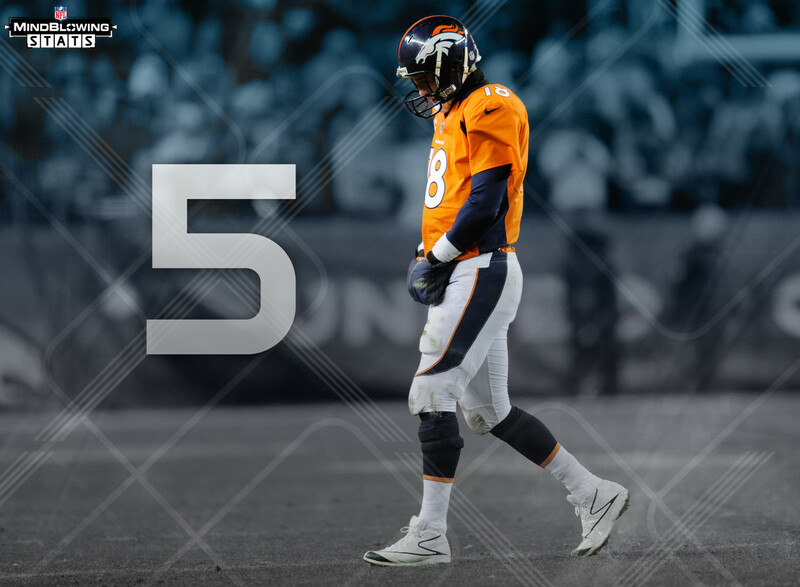 Peyton Manning has lost five home playoff games, the most such losses in NFL history. Manning's teams have lost those games by a combined 14 points (2.8 points per game). John Fox is 1-6 vs. the Patriots and Bill Belichick in his career, including a record of 0-2 against New England in the playoffs. Fox lost Super Bowl XXXVIII with the Panthers and the 2011 divisional-round game with the Broncos. Fox's teams have been outscored by 15.2 points per game in five straight losses to New England. In his 14-year career as a player, Jim Harbaugh started three games against teams coached by Pete Carroll. As Colts QB, Harbaugh lost all three of those games -- one to Carroll's Jets and two to Carroll's Patriots. Given Harbaugh's 2-1 record vs. Carroll as a college head coach and 4-2 record vs. Carroll as NFL head coach, the two are 6-6. Three members of the Seahawks' Legion of Boom earned Pro Bowl selections this season. Richard Sherman led the NFL with eight INTs, and his opposing passer rating of 47.3 was the best of any defensive back in the league (according to Pro Football Focus). Earl Thomas had five INTs and 100 tackles, becoming the first safety to reach both of those totals in the same season since Sammy Knight of the Saints in 2002. Kam Chancellor had three INTs, and his 14 tackles in the divisional round vs. the Saints were a career high. If Colin Kaepernick is looking for a weakness in Seattle's passing defense, the Seahawks were called for 13 pass-interference penalties this season, tied with the Eagles for most in the NFL. Six of the last seven games between Tom Brady and Peyton Manning have been decided by 7 points or less. The two QBs are 3-3 in those tight games, with Brady winning by a 10-point margin in their regular season matchup in 2012. In 2013, Colin Kaepernick had an overall passer rating of 91.6, but a rating of only 41.7 vs. the Seahawks. Four of his eight INTs this season were thrown to Seahawks defenders. Kaepernick threw 21 TD passes on the season, but only one against Seattle. Russell Wilson and Colin Kaepernick combined for 1,063 rushing yards this season. Tom Brady and Peyton Manning combined for -13 rushing yards this season. The NFC Championship Game matches the only two teams in the NFL that rushed the ball on over 50.0 percent of their offensive plays this season. The 49ers led the NFL, rushing on 52.5 percent of their plays, while the Seahawks were right behind at 52.3 percent. The last Super Bowl champion to rush on over 50 percent of their plays during the regular season was the 2005 Steelers, who rushed 57.2 percent of the time with Jerome Bettis and Ben Roethlisberger as key offensive players. The 2004 Patriots rushed 50.6 percent of the time, with Corey Dillon as leading rusher. Peyton Manning's teams have produced three times as many Pro Bowl selections (24) at skill positions than Tom Brady's teams (eight). For Manning, those 24 Pro Bowl selections were divided among nine different players -- three WRs, three TEs and three RBs. For Brady, the selections were divided by only four different players -- three WRs and one TE. A running back has never been selected to the Pro Bowl with Tom Brady as his starting QB. During the Broncos' 31-21 loss to the Patriots in Week 5 of 2012, Demaryius Thomas had 180 yards -- the most receiving yards of any player against a Bill Belichick-coached Patriots team (249 games with NE, including playoffs). Four of the top nine receiving yardage totals against Belichick-coached Patriots teams came with Peyton Manning as the opposing quarterback.